Stellar Planet: The Core of it All! Do all planets have a solid core? A planetary core is the innermost layers of a planet that can be either liquid or solid. It is the densest part of a planet’s interior and contains a large fraction of the planet’s mass. The core can vastly range in size from planet to planet. The core of Mercury is nearly 85% of the planet’s radius while the inner and outer core combined in the Earth consists of only 55% of the radius. With recent observations of large gaseous exoplanets orbiting close to their stars astronomers think that due to outgassing, the loss of the planet’s atmosphere due to interaction with the stellar atmosphere, they may lose so much of their atmosphere that only the cores remain. One exoplanet HD 149026b is thought to have a core 35 to perhaps 110 times the Earths mass (1). But let’s take a look at something a bit closer to home. Does Jupiter have a solid core, can we use it as a yard stick to measure exoplanets against? Using observations from a number of probes that have made their way to and beyond Jupiter, computer models have been developed to predict what the interior of the planet might consist of. Jupiter has an atmosphere that consists of mostly hydrogen and helium that is roughly 1,000 km thick. As you go deeper into the atmosphere the pressure becomes great enough to condense the molecular hydrogen and form a liquid hydrogen layer nearly 21,000 km thick. The pressure under this has increased so much that the electrons are forced away from the hydrogen nucleus creating a soup of liquid metallic hydrogen which is over 37,000 km thick. Now nearly 60,000 km into the planet’s atmosphere we are only 85% of the way to the center and the pressure is already far greater than that at the very center of the Earth. Gravitational measurements have shown that Jupiter has a central mass 5 -10 times the mass of the Earth (2) in a volume only twice the size. 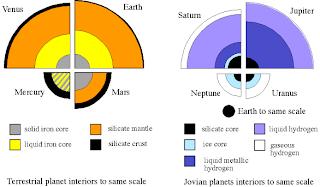 According to current planetary formation theories, “core-accretion” model or “top-down” theory, Jupiter would have needed a massive rocky core to accrete (capture) enough gas, in the early stages of the solar systems evolution, to become the giant we observe today. However, it is now theorised that this original core may have become mixed with the other interior layers of the planet due to the intense heat and pressure along with the fast rotation of the planet. As you can see the core at the center of Jupiter is still in the forefront of planetary science. On August 5th 2011 NASA launched a mission to Jupiter to as part of the New Frontiers Program, Juno. Juno will aim to “Improve our understanding of the solar system’s beginnings by revealing the orign and evolution of Jupiter”. It will arrive at Jupiter in July 2016 and hopefully shed some light on planetary formation theories. Through a combination of observations we are able to determine a lot about a planet and with an understanding of planetary structure from our own solar system and gouverning physics we can deduce their structure. However, if we do not have a clear understanding of our own planets, so close to home, then what can we truely extrapolate out to others. It is exciting that those answers are within our grasp thanks to missions like Juno and hopefully this will then mean that we can answer this question for the vast array of alien worlds that have been discovered thus far. Great post! What role (if any) do you think the composition of a planet might play with regards to prospective life? 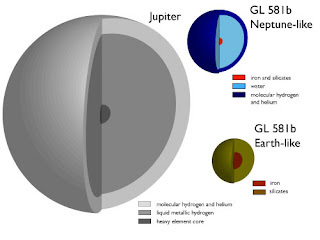 I understand we need water and possibly other criteria to be met (depending on who you ask) but do you think the geological makeup of planets might factor into the equation at all? I have been thinking about that question for a while with the aim to write a post on it, however, I can't seem to nail down the facts, if any, that we have. I personally think that the composition and geology of a planet plays a major role in the ability to support life. You only need look to Venus and Mars which are themselves just inside the Sun's habitable zone to confirm it in some ways. There are so many factors that could (double underlined)contribute to life but we truely dont know.